Not sure if it’s the fluoride in our water or an indictment of federal control of our ‘alleged’ education system but the result has been a general acceptance of myth as an explanation of what happened on 9/11. The government, quite simply, fabricated a myth for its gullible civilian population (us) which (seemingly) explained everything it needed to in order to send us off to war and throw our Republic’s Constitution into the dust bin of history. Leaving aside the Pentagon and Shanksville, simply put, Osama bin Laden sent a gang of arabs* to fly planes into two building in New York which caused three buildings to fall down. 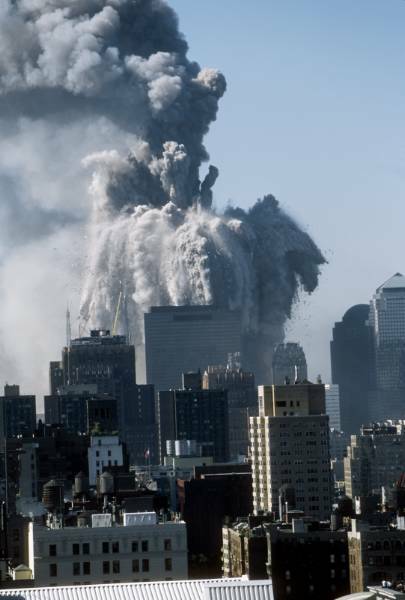 The planes caused fires, fires weakened the support columns to the degree that the buildings fell, turning into dust along the way. *There ‘is’ the minor detail that of the nineteen guys ‘identified’ by the FBI as having highjacked the planes, eleven of them are, in fact, alive and well having nothing what-so-ever to do with the attacks. Odd, huh? Sure enough, in September 2002, FBI director Robert Mueller told CNN twice that there is “no legal proof to prove the identities of the suicidal hijackers.” He openly admitted that some of the identities of the 9-11 hijackers are in question due to identity theft. One of them, Abdul Aziz Al-Omari (Flight 11) a pilot with Saudi Airlines, walked into the US embassy in Jeddah to demand why he was being reported as a dead hijacker in the American media. Another one, Saeed Al-Ghamdi (Flight 93) who is a trained pilot working for Tunis Air, stated at the time “I was completely shocked. For the past 10 months I have been based in Tunis with 22 other pilots learning to fly an Airbus 320. The FBI provided no evidence of my presumed involvement in the attacks.” Etcetera, etcetera. What about Bin Laden? According to a CBS report by Dan Rather, Bin Laden was admitted to the urology ward of the Rawalpindi military hospital on September 10th where (I guess) he orchestrated the 9/11 attacks. According to Rex Tomb, Chief of Investigative Publicity for the FBI however, when asked why there is no mention of 9/11 on Bin Laden’s Most Wanted web page, Tomb said, “The reason why 9/11 is not mentioned on Usama Bin Laden’s Most Wanted page is because the FBI has no hard evidence connecting Bin Laden to 9/11.” Hmmm..if the arab guys they said ‘did it’, didn’t do it, then who… oh well, let’s move on. The WTC buildings fell down because of rather ‘hot’ fires that resulted from the burning jet fuel (kerosene) and office debris/materials. 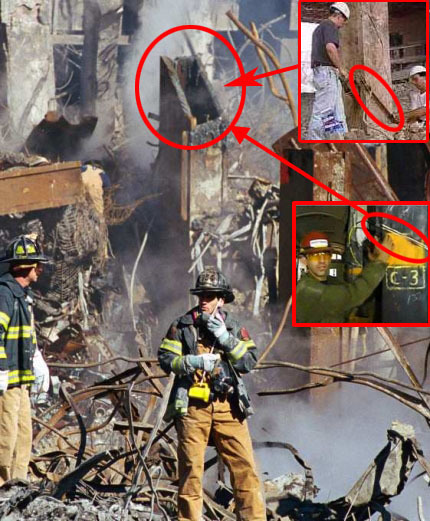 The WTC1/North Tower caught fire and smoldered 85 minutes before exploding into dust while the South Tower turned to dust in a mere 56 minutes. Denny-the-dunce Question 1.] 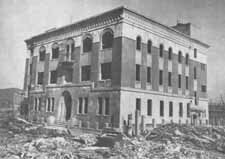 The office building pictured below (left) caught fire on 13 February 1975. 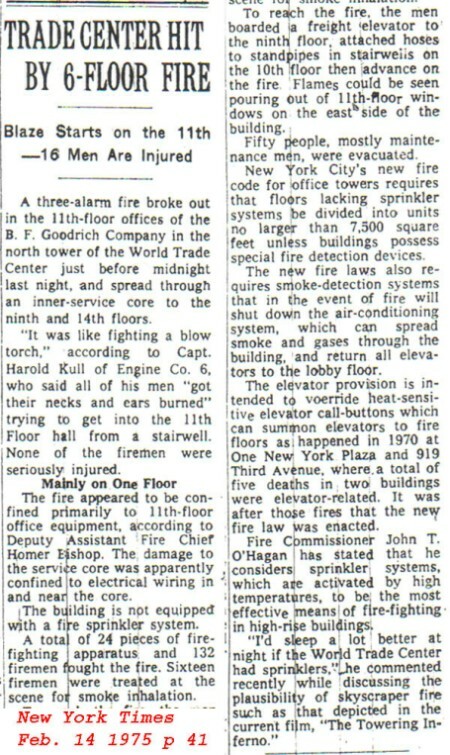 Fire spread through the core of the building igniting and burning six floors for a total of three (3) hours. The result was negligible beyond the NYC fire marshal ordering sprinklers installed after the fact. Yup, you guessed it! 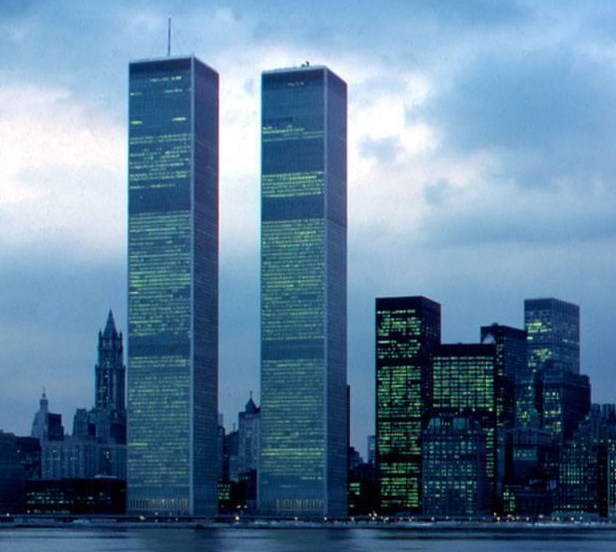 It’s the World Trade Center. So, why didn’t the building (WTC1/North Tower) explode into dust and fall down back in February of 1975 when it burned for significantly longer than on 9/11? Why? Because no open air carbon based fire can get to 2,200 degrees which is why we have never in history seen (until 911) a skyscraper’s steel columns melt. Denny-the-dunce Question 2.] 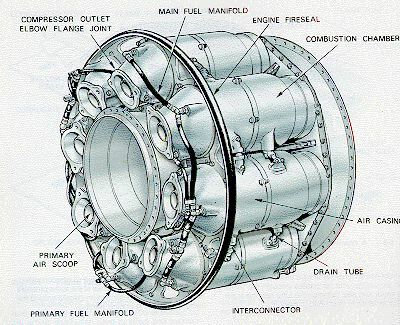 The image below is of a multiple chamber combustion system within a turbofan jet engine ‘a la 757 airliner and these engines run for 9 to 13 hours depending on fuel load without stopping. The temperature of the gas after combustion is about 1000 °C. Why don’t these engines turn to dust like the Trade Centers or, at least, melt at these temperatures (higher than those on 9/11) and the planes powered by them, fall from the sky? Denny-the-dunce Question 3.] 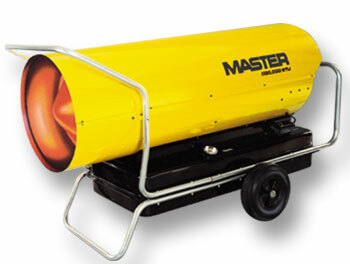 The photo below is of a standard, cheap-assed (probably made in China) torpedo heater used everywhere. It’s fired by either kerosene, JP-8 Fuel or Jet A Fuel and carries enough of this fuel to continuously run for almost 9 hours. Denny-the-dunce Question 4.] 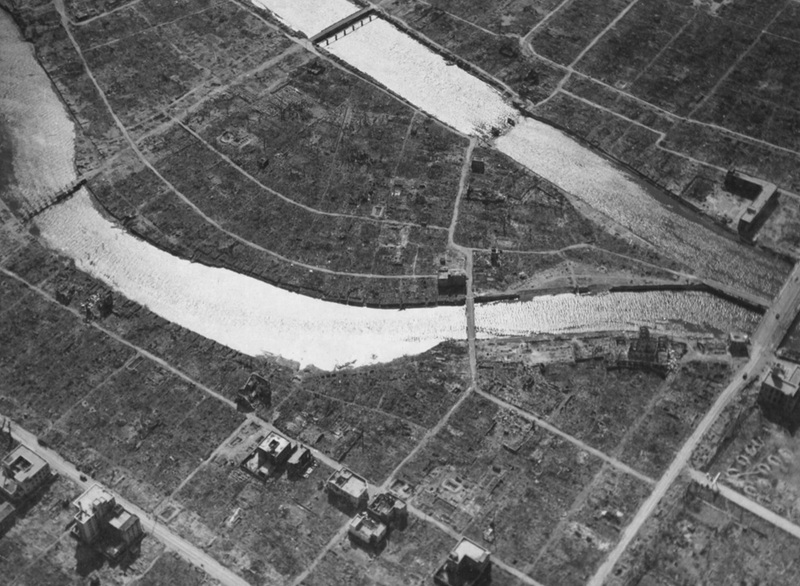 The buildings pictured below weren’t hit by an airliner but they were 250 feet east directly under the atomic bomb detonation in Hiroshima – the atomic firestorm and over-pressure of the blast took out every wooden structure for miles but didn’t knock these buildings down or turn them to dust. 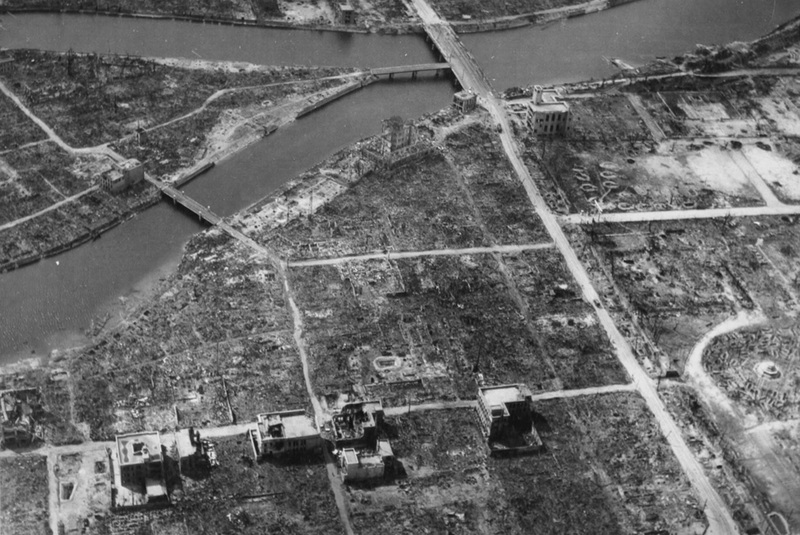 Why do simple brick and mortar buildings erected in the 1920s survive an atomic blast while the World Trade Center buildings, built from reinforced (36”) steel beams and concrete, explode into dust from “office fires” burning for a little over an hour? Obviously, there’s been a huge amount of research by folks far smarter than I who clearly eviscerate our government’s claim of why the three buildings in New York turned to dust on 9/11. The fact that the general population isn’t in the streets DEMANDING the truth rather than myths, leads one to conclude that either Americans ‘believe’ the government’s nonsensical explanation due to their exposure to fluoride in their public water supply or the government’s dumbing down of publicly schooled Citizens has worked so well that Americans are incapable of asking questions which, logic requires that we ask. I don’t want to sound like a drooling idiot but, rather than drinking from that cold, deep pool of ignorance, should simple questions like these be answered BEFORE we contemplate listening to any further nonsense coming out of our ‘government’? Now, get out to Walmart and buy one of those Chinese made yellow ribbons and stick it on your mini-van, your pick up truck or your BMW and wave that flag to show everyone just how ‘patriotic’ you are. Never mind the questions posed above. There’s nothing going on here. Go about your business. Don’t ask (we won’t tell). Pay your taxes and remember to catch Dancing With The Stars tonight. This entry was posted in Foreign Affairs, History, Israel, Muslims, terrorists and tagged 757 airliner, 9-11, 9/11, atomic bomb, bin Laden, Hiroshima, Israelis, jet fuel, North Tower, South Tower, World Trade Center, WTC. Bookmark the permalink.